The average price of a property in Acton in the third quarter of 2010 was £366,343 according to figures from the Land Registry. This is the highest quarterly average on record for the W3 area. 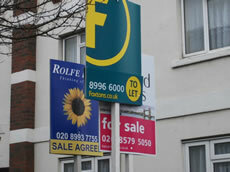 Terrace houses are now changing hands for an average £487,881 that's an increase of nearly 15% in the last year. Semi detached houses are selling for £679,730 - 43% higher than last year. Overall the volume of sales is up with 162 properties changing hands in the last quarter - compared to 129 from April - July. UK house prices are down overall but buyers are traditionally reluctant to part with their money in the lead-up to Christmas. According to the Rightmove House Price Index new sellers cut their asking prices by 3.2% in November – the largest decline seen since December 2007. The index said there was now an "unseasonably high number" of unsold properties on the market amid a dearth of first-time buyers and buy-to-let investors.